The German domestic longcase clock. This article is based on a lecture given to the Antiquarian Horological Society. 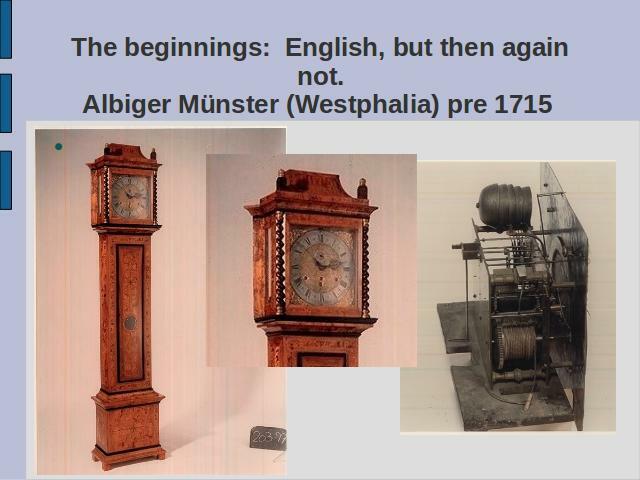 The lecture was intended to introduce to an international (or even German) horological audience the fact that there is more to German horology than just renaissance clocks, Black Forest clocks or Riefler clocks. In the eighteenth century provincial German clockmakers made longcase clocks for local customers just as in the British provinces. 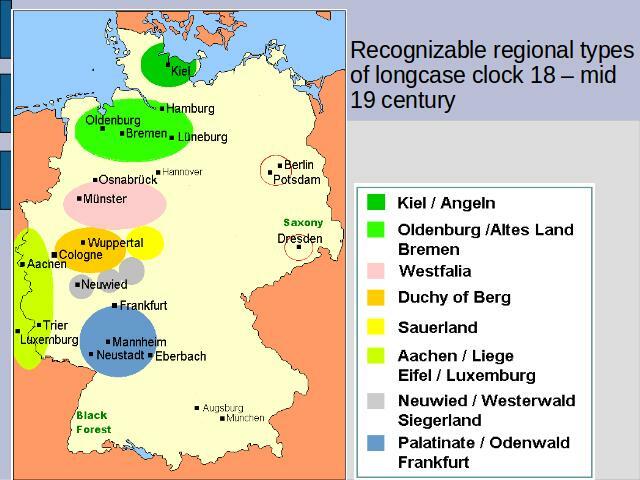 The various German types of longcase clock are unknown not only abroad, but also in different parts of Germany. The English longcase clock had established itself as a characteristic type long before 1700 and 100 years later it had become in all parts of Great Britain an household item in all but the poorest homes. What was the situation in the neighbouring countries? In Northern Europe the longcase clock also became popular in the eighteenth century, first in the residences of the wealthy and soon after among the middle classes. This was certainly the case in Northern Germany, i.e. the states north of the river Main and west down the Rhine as far as the Palatinate. 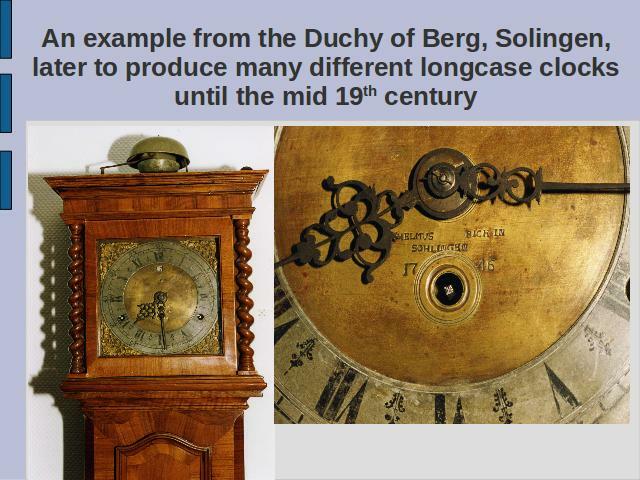 In South Germany and Austria longcase clocks were also made individually, but for affluent households, and regional types do not dominate. 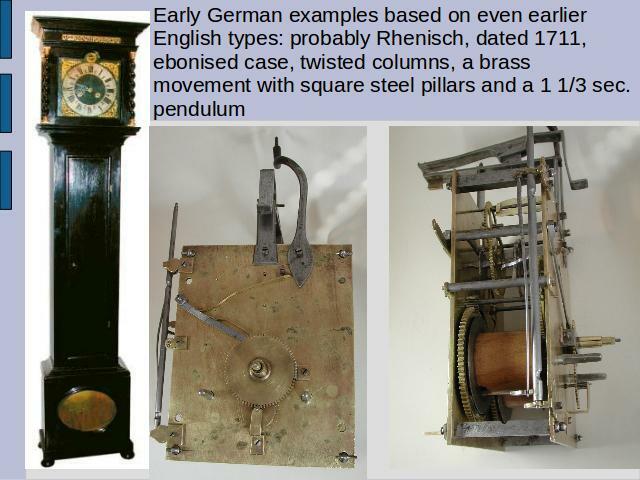 As yet there is no overall comparative documentation of the regional variations of the German longcase clock. For an overview the horologist must resort to consulting exhibition catalogues from provincial museums, publications by local history societies, or general horological books. 1. Recognizable regional types of longcase clock 18 – mid 19 century. The political situation in Germany, (or better the German speaking states), in the eighteenth century was such that the Holy Roman Emperor of the German Nation resided far away in Vienna, but he had little significance in the lives of those living in Berlin, Hamburg or even Frankfurt for instance. Thus there was no centralized state government or capital city as London or Paris which set standards in art, design, and least of all horology. The diversification in the regional types of longcase clocks is therefore probably more impressive than in Great Britain. The influence of the London longcase clock can be seen immediately in a clock signed Johan Albiger Münster, but at the same time it is obviously not an English case or dial. It can be dated to before 1715. The movement may have been procured at least in part from London. Similarly a month going clock by Jacob Schröder in Kiel, dated 1726, looks at first glance even more English. Kiel is in Schleswig Holstein, an area always strongly linked to Denmark. 4. England - North Germany - Denmark. 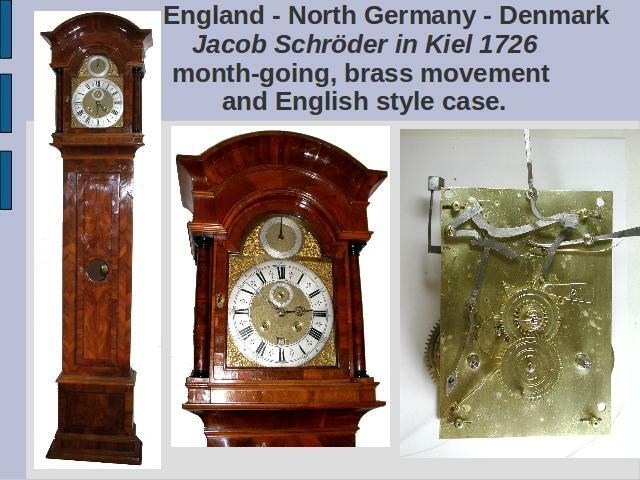 Jacob Schröder in Kiel 1726 month-going, brass movement and English style case. A Liverpool clockmaker, Peter Green emigrated to Appenrade, now in Denmark but then Germany, in the first half of the eighteenth century. In the province of Angeln, today part of Schleswig Holstein, a regional type of clock was made by local families into the nineteenth century. 5. Castens Bremen. 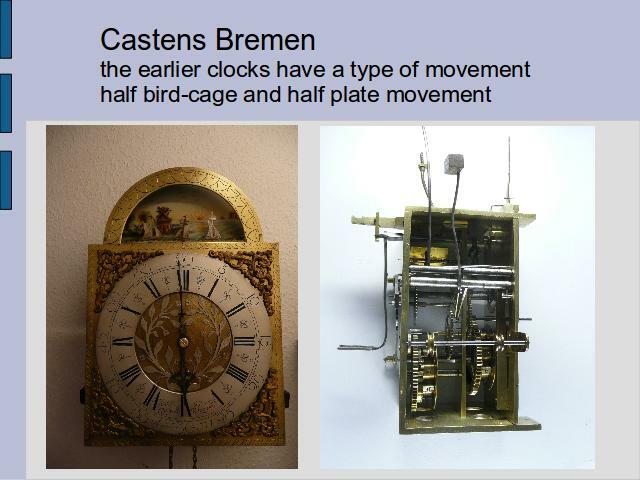 The earlier clocks have a type of movement half bird-cage and half plate movement. Bremen and Hamburg were important ports with wealthy merchant comparable to the situation in Liverpool. The later clocks were even more like English longcase clocks. A large, unsigned German clock, probably from the Rhineland around Cologne, dated 1713 has, in the London tradition, an ebonised case, spiral twisted colums, putto and crown spandrels and an extra long pendulum (1 1/3 seconds), but it is obviously not English. The spandrels are cast in pewter or lead, the chapter ring is pewter and has painted numerals (i.e. not engraved), and the plates are steel; all typical traits for provincial German clocks. ebonised case, twisted columns, a brass movement with square steel pillars and a 1 1/3 sec. 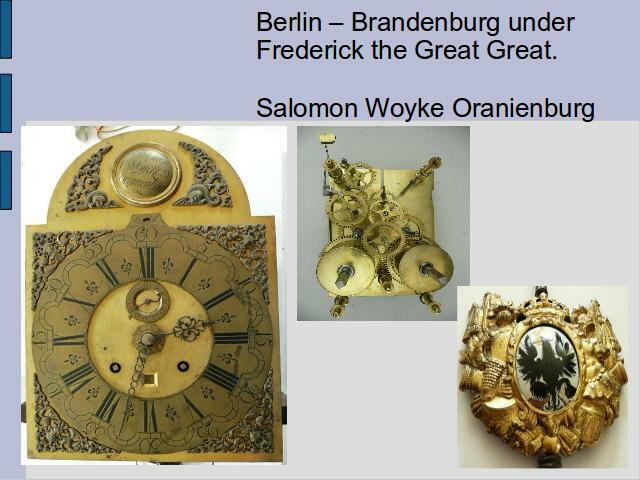 The English influence is also evident in the longcase clocks of the further eastern areas such as Brandenburg with centres Berlin and Potsdam and Saxony with Dresden as the centre although these clocks may have been supplied to richer customers. Interestingly there are numerous Saxon cases with authentic English movements usually by William Jourdain or William Smith in London. 7. Berlin – Brandenburg under Frederick the Great Great. A clock by Salomon Woyke Oranienburg. The pendulum weight shows the atributes of the Prussian state including an enamel eagle with the initials FR in gold (now only faintly visible). The movements of the baoque longcase clocks of this area are definitely based on the English movement, and later (1800 onwards) a typical longcase movement for this area became popular. There was probably a supplier of blank movements in the Berlin area. 8. The Saxon (Dresden) connection and English influences. 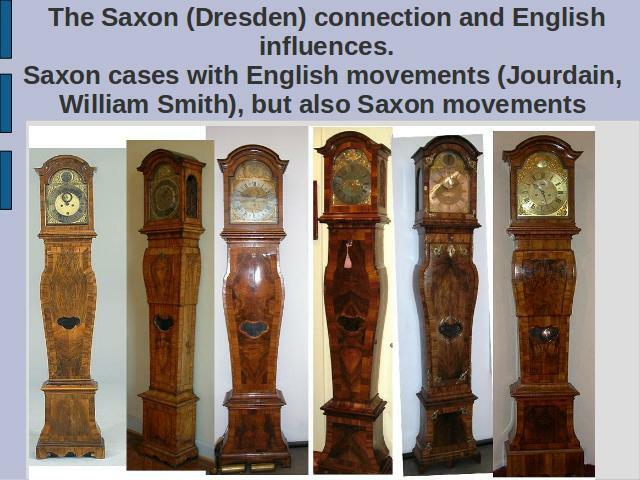 Saxon cases with English movements (Jourdain, William Smith), but also Saxon movements can be found occasionally. 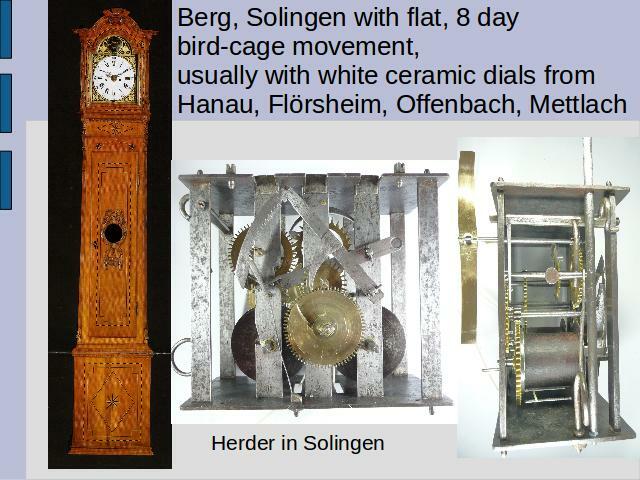 The demand by the middle class for a domestic clock and the provision of such by local craftsmen is especially apparent in the Duchy of Berg on the right hand side of the Rhine with the centres Solingen and Elberfeld. Thousands of clocks were made here of many types and qualities and the formal style of the cases as well as the movements show an individual style which might seem strange to a British horologist. 9. Probably one of the earliest longcase clocks from the Duchy of Berg by Wilhelmus Bick dated 1746 showing stylistic characteristics of an English clock before 1700. However, the 8 day movement is of a flat "bird cage" type, the chapter ring is made of pewter and the numerals are in this case painted and not engraved. 10. A typical Berg longcase clock by Johann Daniel Herder in Solingen from around 1800. This type of case is attributed to a cabinet maker Carl Wilhelm Machenbach of Schlicken near Solingen. This type of flat bird cage movement in steel was used by numerous clockmakers and there probably existed a division of labour whereby the frames and probably other parts would have been made by specialists such as smiths. Typical for this type of Berg movement is the rack, which falls vertically, the large fly, the wooden gut barrels and the vertical hammer harbor for the 2 bells above the hood. The ceramic dials associated with these clocks were made far away in Hanau, Offenbach, Flörsheim (in the Frankfurt/Main area) and later Mettlach in the Saarland. 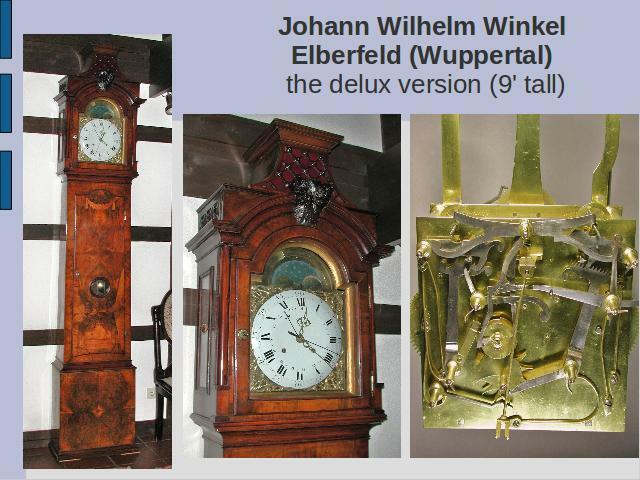 The best quality examples of Berg clocks are by Winkel in Elberfeld. 11. Johann Wilhelm Winkel Elberfeld (Wuppertal) the delux version (9' tall)‏. In the later clocks Winkel used brass plated movements. He put the striking work on the back plate. Clocks with centre seconds, Dutch striking, date work and moon phase with enamel dials from Neuchâtel (which were said to cost much more than the ceramic dials) were standard. After the Napoleonic wars clockmaking in the Duchy of Berg declined, but continued in rural areas as late as the second half of the ninteenth century. About 100 km further south on the Rhine in the town of Neuwied probably the best German clockmaker family of the eighteenth century set up shop in 1740. 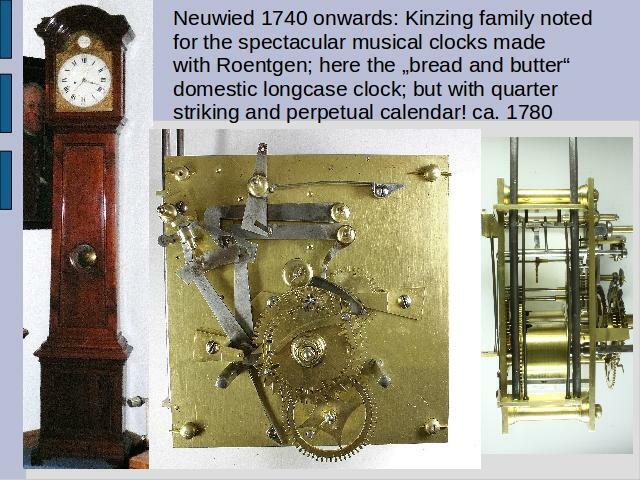 Christian Kinzing, his son Peter, later famous for his compound musical movements in cooperation with the cabinet maker family Roentgen, and other family members (Hermann Achenbach, Heinrich Gram) produced hundreds of domestic longcase clock movements from simple single-handed, 30 hour, steel plated examples to 8 day brass movements with quarter striking and perpetual calendar for the local market as far as Frankfurt/Main. Many are still in regular use. with Roentgen; here the „bread and butter“ domestic longcase clock; but with quarter striking and perpetual calendar! ca. 1780. The clockmakers in Neuwied made invariably plated movements. The later clocks all have brass plates. Related to the Kinzings and belonging to the same Mennonite religious sect were the Möllingers of Neustadt, west of Mannheim. 13. Jacob Möllinger in Neustadt/Palatinate related to the Kinzings and probably an influence. Distinctive style and influenced many others. His son Christian Möllinger became court clockmaker in Berlin. The movement above has a form of quarter striking whereby the single hammer is used for both bells. It is tilted by an extension of the quarter rack. 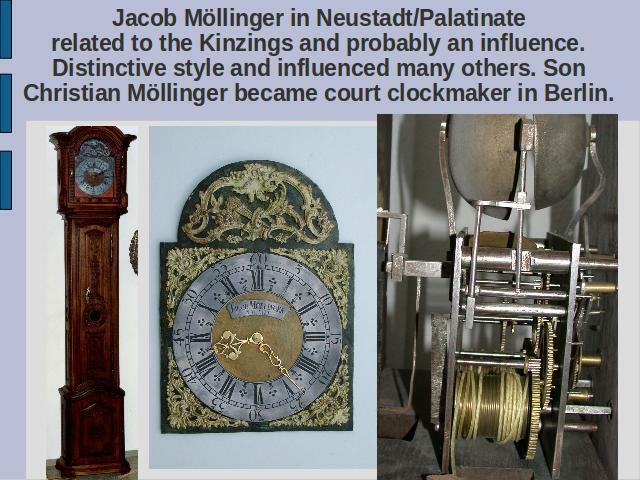 The founder of the dynasty, Jacob Möllinger, also trained other notable clockmakers such as Jacob Braun from Eberbach in the Odenwald east of the Rhine where other clockmakers soon took up the trade so that the Odenwald longcase clock can be accepted as a regional type. (brother emigrated to Lancaster/ Pennsylvania. 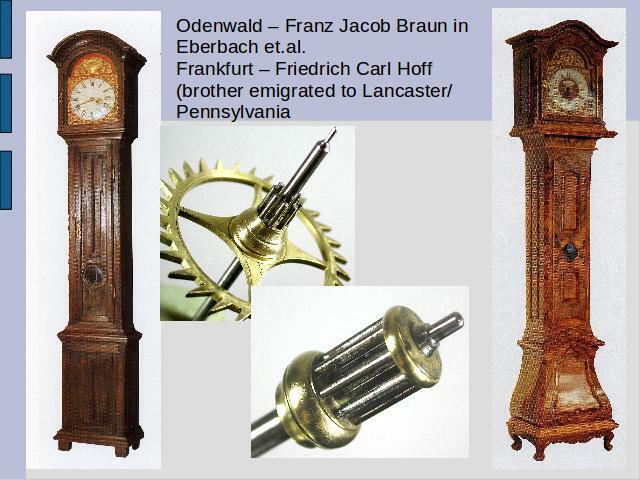 Friedrich Carl Hoff, city clockmaker in Frankfurt, also trained with Jacob Möllinger and produced longcase clocks in a very similar style to the Möllingers. Typical for all these makers and others trained by Möllinger are the lantern pinions. Other regions such as Aachen and the Eifel area have definite types. These clocks are recognizable mostly by their intricately carved dark oak cases and iron framed, 30 hour, bird-cage movements. 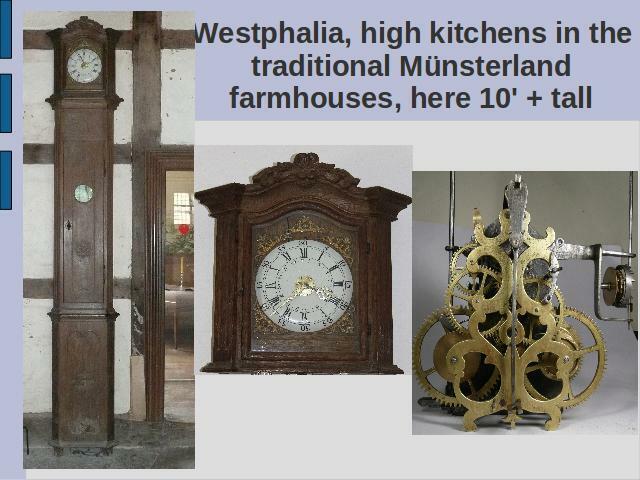 In the rural area of Westfalia around Münster a distinctive type of longcase clock was made with a simple 30 hour movement in an extremely tall case for the open kitchens of the large farm houses (3 meters high is not uncommon). 15. Westphalia, high kitchens in the traditional Münsterland farmhouses, here 10' + tall. In this case the movement has a skeletonized back plate and a steel front plate. It has rack striking and the alarm mechanism is often to be found on rural long case clocks. In the Sauerland, east of the Duchy of Berg clockmaking became a tradition in some rural families although it is uncertain whether they formally learnt the trade (a question which applies to many provincial German clockmakers, including even Kinzing!) or "picked" it up working as local smiths. 16. 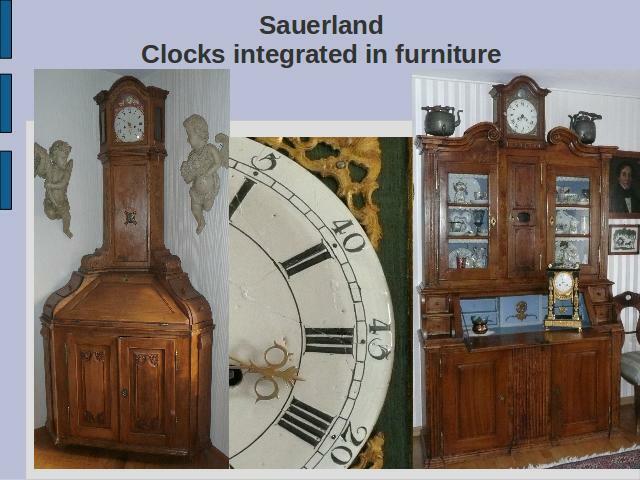 In the Sauerland longcase movements are sometimes to be found in furniture. Ceramic dial were used here too. Faulty examples were still used. Here the numeral painter has made a mistake and the dial was subsequently fired so that the mistake became irreversible. Nevertheless it was sold. Strangely enough these faulty examples turn up on clocks from the Sauerland, where the rural population still could not read properly. At the same time as the painted white dial was introduced in Great Britain the enamel dials originating from Neuchatel in Switzerland appeared on better quality longcase clocks by such makers as Kinzing or Winkel. On account of the heavy import duties through the numerous small states they were, however, too expensive. Cheaper ceramic alternatives were made from 1780 onwards in the faience manufactories around Frankfurt (Hanau, Flörsheim, Offenbach), and later in Wallerfangen in the Saarland. This type of dial is to be found almost exclusively on the longcase clocks from the Duchy of Berg, the Sauerand and Siegerland, and Westfalia. 17. 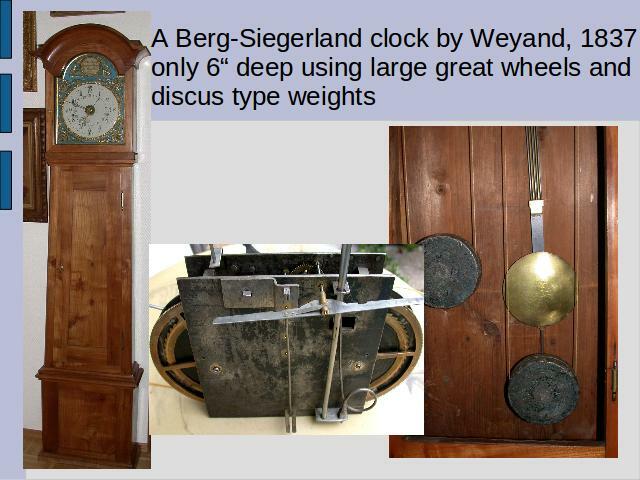 A late type of clock by Weyand in Werfen (near Eitorf on the river Sieg) which was made extremely flat using great wheels with up to 240 teeth and flat "yo-yo" shaped weights. After the Napoleonic Wars the demand declined, but clocks were still made in rural areas such as the former Duchy of Berg, the Sauerland, Siegerland and Westfalia, but no longer in Neuwied, the Odenwald or Palatinate. Cheap Black Forest clocks were sold by hawkers and cases were made in the local styles. By 1850 it was no longer economical for a local clockmaker to produce hand made movements. Jürgen Abeler, Altbergische Uhren, 1968. Helmut Krieg, Bergische Uhren, 1990. Helmut Krieg, Uhrmacher im bergischen Land, 1994. Jan Carstensen, Ullrich Reinke, Die Zeit vor Augen, Standuhren in Westfalen, 1998. Dietrich Fabian, Kinzing und Roentgen, Uhren aus Neuwied, 1983. Eugen Denkel, Ian Fowler, Uhren und Uhrmacher vom Mittelrhein, 1992. Kinzing & Co, Uhren aus der Provinz, Ausstellungskatalog Neuwied, 2003. Günther Vosgerau, Rund um die Uhr, die Kunst des Uhrmachers in Stadt und Land zwischen Weser und Ems, 1996. Igor Jentzen, Uhrzeiten, Frankfurt, 1989. Peter Eidmann, Alte Odenwälder Uhren und ihre Meister.